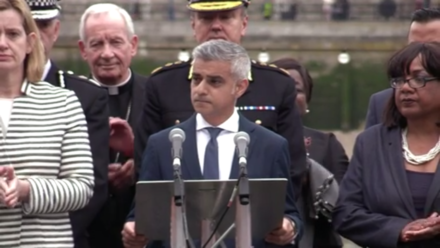 Sadiq Khan delivered an uplifting speech to Londoners and vowed the capital will “never be broken by terrorism” as thousands came together to remember the victims of Saturday’s attacks. The mayor addressed a vigil alongside Diane Abbott, Amber Rudd, police chiefs and religious leaders last night in Potters Field, less than a mile from the scene of the atrocities at London Bridge and Borough Market. Khan spoke of his identity as a “proud and patriotic” British Muslim and delivered a withering condemnation of the attackers’ “perverse ideology” as well as paying tribute to the spirit of Londoners who risked their lives to care for the injured and offer hospitality to the lost, frightened and lonely in the aftermath of the attack. “London stands in defiance against this cowardly attack on our city, our people, our values and our way of life,” Khan told the crowd. “As the mayor of London I want to send a clear message to the sick and evil extremists who commit these hideous crimes: We will defeat you. You will not win. Khan was speaking at at an emotional event on the banks of the river Thames. Londoners young and old and of different races and faiths gathered to hear Khan and lay floral tributes to honour the dead. Seven people were killed in the attack and 48 injured. With emergency service workers in attendance yesterday, Khan paid tribute to those who perished as well as those who came to their aid. “Today we mourn the loss of innocent lives – Londoners and people from around the world. We send our love to the victims families and to all those who were injured. “We thank our courageous emergency services and the brave Londoners who risked their lives to care for others. You are the best of us.